While I’m not a doctor, it doesn’t take one to start noticing trends in medical diagnoses, especially when you are as immersed in the healthcare world as I have been, now that I have a child who has special needs. Every so often it seems like more and more people are being diagnosed with something and prevalence statistics are skyrocketing. Then you have things like the K-E diet, where people began using Nasogastric feeding tubes to supplement nutrition while depriving one’s self of caloric intake as a way to lose weight. As a parent of a child who REQUIRES a feeding tube to LIVE, I can assure you that feeding tubes should not be used as part of a fad diet. Fads have no place in healthcare. Whether that fad is in the form of a new diet or a medical diagnosis, it is unfair to those who truly suffer from a disease and it is unfair to people who are misdiagnosed simply because it’s the diagnosis of the moment, when in reality there is so much more to their story. Even before Braxton came along, I had worked in a pediatrician’s office, so I was very familiar with a variety of diagnoses and even helped to send out and collect the necessary paperwork for Attention Deficit and Hyperactivity Disorder, more commonly known as ADHD, evaluations. As a child, my brother was diagnosed with ADHD and ODD (Oppositional Defiant Disorder) so I was aware of its existence and how it presented in children and adolescents. As I got older, it seemed like everybody was diagnosed with some sort of ADHD or ADD (ADHD without the hyperactivity part). This PubMed article states that between 2000 and 2010, ADHD diagnoses increased approximately 66%! It honestly seemed as though anyone who took their child to the doctor for any sort of behavior or attentiveness issues came out with an ADHD diagnoses and was subsequently medicated. There was seemingly no second thought to any other causes or underlying issues. Perhaps a different learning disability, or a simple case of kids being kids. I’ve always questioned whether or not ADHD should be diagnosed in children as young as 3. At 3 years old, children are naturally curious, rambunctious, wild, inattentive, fidgety and mischievous. Regardless, doctors were quick to give that label and add another notch to their belt. 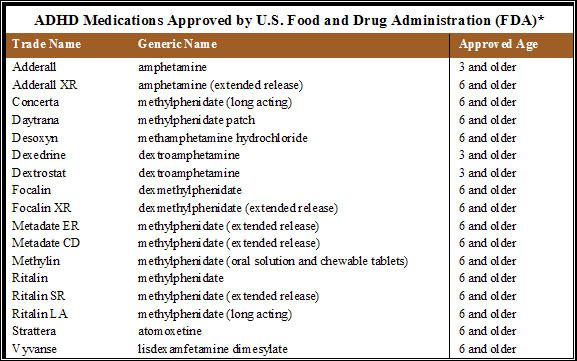 Below is a table of currently approved medications to treat ADHD as well as the age in which these are approved for. I’m appalled by the thought of giving my 3 year old Adderall! I do have to say that I think ADHD is absolutely a valid medical diagnosis and there ARE children who have significant issues that need to be addressed, but my problem is that ADHD is so easily thrown out that it is over- and often mis-diagnosed in many children. It seemed to be a for a long time the “hot diagnosis” of the time. Now, you may be thinking, “My child did have ADHD and we medicated and I saw great results, etc.” but consider this for a moment. There are PLENTY of people who do NOT have a formal ADHD diagnosis who have seen the SAME benefits as those with a diagnosis. I have seen and heard countless stories of teens and college students taking Adderall because it helped them focus better on their schoolwork. Does that mean they all have ADHD that went undiagnosed or is it more a matter of the natural side effects of that medication on the brain that enable them to focus so much better? Honestly, I’m not sure, but it is definitely something to think about. While ADHD is still a common diagnosis, it is less heard about than in years prior. Now, that “hot diagnosis” seems to be Autism. Wait just one minute before you get the pitchforks out. Again, I recognize that Autism is VERY real and there are indeed many legitimate causes for concern. Here are my concerns: an increased number of children who have underlying genetic diseases are inappropriately being diagnosed as also having autism. There are also an increased number of children who are receiving an autism diagnosis when, in fact, there is something MORE to the story. So you see, I’m not at all trying to diminish or belittle any parent struggling through an Autism diagnosis. I know it’s hard. I get it. I really do. I want the healthcare professionals to understand that there is more than Autism out there. They NEED to take a deeper look instead of just going with the latest fad. They owe it to you. They owe it to your child. Have you ever thought there might be something more to your child’s story? More importantly, do you think your doctor’s even considered it or did just throw a label out to get you services? Services are fantastic, but only when they are the right kind. A proper diagnosis is important when determining what services and what types of therapies can improve a child’s quality of life. This led me to do some further research, as this is something I have thought for quite some time. At about 18 months old, I took Braxton in for a routine appointment with his developmental pediatrician. As per the industry standard, I was given the M-CHAT (Modified Checklist for Autism in Toddlers) to fill out regarding Braxton. The M-CHAT is a tool used to screen children for early signs of Autism that would lead to further diagnostic testing and intervention. This is a great tool for that purpose, however it is lacking in many ways, which I did not discover until this particular visit. 1. Does your child enjoy being swung, bounced on your knee, etc.? 2. Does your child take an interest in other children? 3. Does your child like climbing on things, such as up stairs? 4. Does your child enjoy playing peek-a-boo/hide-and-seek? 5. Does your child ever pretend, for example, to talk on the phone or take care of dolls, or pretend other things? 7. Does your child look at you for a second or two? 8. Does your child respond to his/her name when called? I answered all of these questions honestly, and for most of them, the answer was a resounding ‘NO.’ Braxton had all of the ‘clinical’ red flag indicators of Autism. Instead of taking Braxton’s history and the ‘big picture’ into consideration, the doctor simply said that we needed to see a doctor more specialized in developmental assessments who could make an Autism diagnosis. Flustered, I called our Physical Therapy supervisor who I knew had a better understanding of what Autism is and what it isn’t, and I spoke to our Speech Therapist for the same reason. Both of them assured me that they did not see in him what would be considered classic signs of Autism. Due to Braxton’s vision and hearing impairments, both of them stated those were more the root of the cause for Braxton rather than Autism. We did not know the extent of damage to his vision due to the coloboma in each eye, but we knew it could possibly effect what and how much he sees. Therefore, he would be lacking in the eye contact and interaction aspect of the M-CHAT questions. At this point, we also had just gotten Braxton’s hearing aids and had just found out about his hearing loss. So basically, for the first year and a half or so Braxton was unable to really hear, and therefore unable to respond to his name, imitate sounds, babble, etc. He had two very important senses affected as part of his genetic syndrome that caused him to raise every Autism red flag indicator, but it did NOT mean he had Autism. At his 2 year check up, once we had an official diagnosis, I relayed this information to the Dr (different than the one we saw at 18 months) and told her we did not follow through with the referral one, because it was a complete mess, but that’s another story, but also because in consulting with our pediatrician and therapists we decided he was not in need of further evaluation because his symptoms were due to his early sensory deprivation and not Autism. I also felt that he was being followed by more than enough specialists who were capable of making further diagnosis if necessary. The doctor agreed and mentioned that in her short evaluation, she could see the red flags, but recognized the early delays and also saw in him things that would not be consistent with an Autism diagnosis. This is just how the issue of misdiagnosis relates to our story. I sought out other resources and to my surprise found that we were not the only family who had an underlying genetic condition and was also given a Autism diagnosis. The Journal of Intellectual Disability Research published a study in 2009 as it relates to this very topic. They studied the prevalence of Autism diagnosis in conjunction with several disorders that have a known genetic cause including Fragile X, Down Syndrome, Angelman, Cystic Fibrosis, and Rett Syndrome just to name a few. This is incredibly alarming. How many people receive an Autism diagnosis and just stop right there? What if that 18% didn’t keep pursuing further diagnostic testing? What if more than that 18% is affected? This illustrates the importance of medical professionals looking in to the big picture and not just going with what is hot at the moment. The sad reality is that for many of that 18%, it wasn’t until things got much WORSE that anybody gave them a second thought. We shouldn’t have to wait for disaster for someone to do a little extra work to begin with. This also supports the idea that a misdiagnosis can be beneficial if used appropriately to acquire services and education placement necessary for a child to be successful. But, I caution that a misdiagnosis should never ever be the goal JUST to obtain services. Find a doctor who will fight for your child just as you are fighting and will get you what you need the right way. There has also been an increase in new information stating that some Autism Spectrum disorders have more links to Mitochondrial disease and also warrant further testing. Mitoaction also has information on having a child who has an Autism diagnosis tested further for Mito. Whenever I learn that a new parent has a child with multiple systems affected but is being given an Autism diagnosis, I can’t help but cringe. It may in fact be true Autism, but the reality is that it could be more, so much more. I can’t help but think about all the children who are not being diagnosed properly and who are not getting the treatment they need. I’m not saying to not believe your doctors, but I am encouraging everyone to do more research and pursue further testing when your parental instinct tells you that the answer is not that simple. Don’t let your child become part of some doctor’s repertoire for ‘diagnosing autism early,’ or think that just because he failed the M-CHAT he MUST have ASD, your child is so much more than a diagnosis and deserves to have someone speak up for them. That someone is YOU. As the parent, you are the advocate. If something doesn’t make sense, ask more questions. The doctor may hold a degree, but there is much more in the real world than they ever read about in a book, not to mention you spend day in and day out with your child and know them better than any book could ever teach a doctor. Don’t be afraid to stand up. Don’t be afraid to go against the trend. Always, always remember that fads are for fashion and not healthcare. Your child is not a fad, don’t let them be treated as one.